The Owl Drug Company commenced business in San Francisco in 1882. They dispensed their medicines, pills and poisons in their highly recognisable embossed owl bottles. 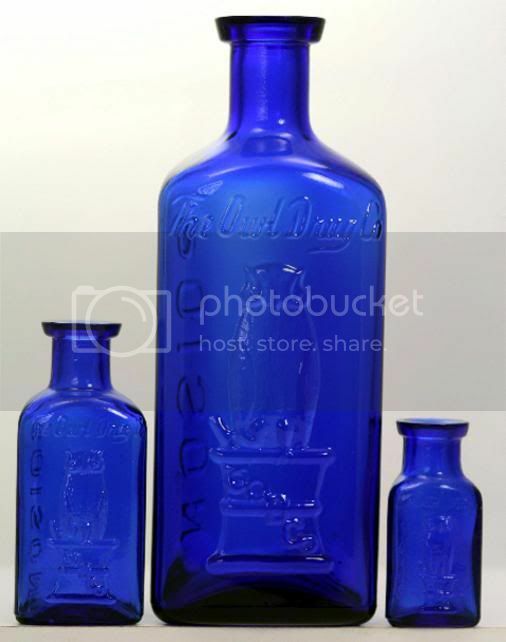 The bottles are found in cobalt, green, amber and clear but it’s their cobalt blue triangular poison bottles, which obviously appeal to the poison bottle collector. 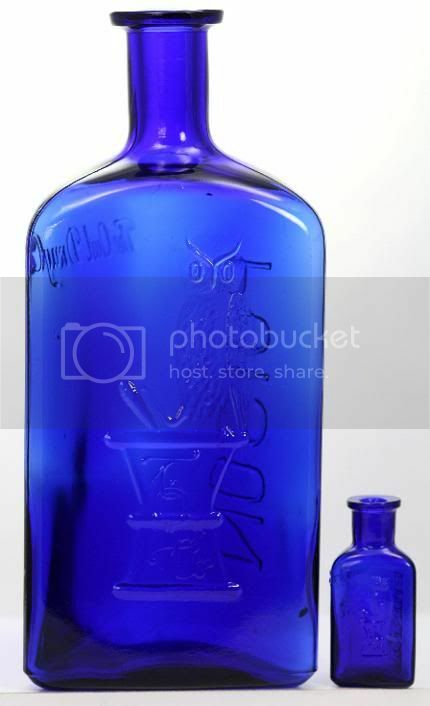 There are ten sizes of their one wing owl poison bottle, which first appeared in 1903, extending from a ½ ounce up to a 32-ounce. 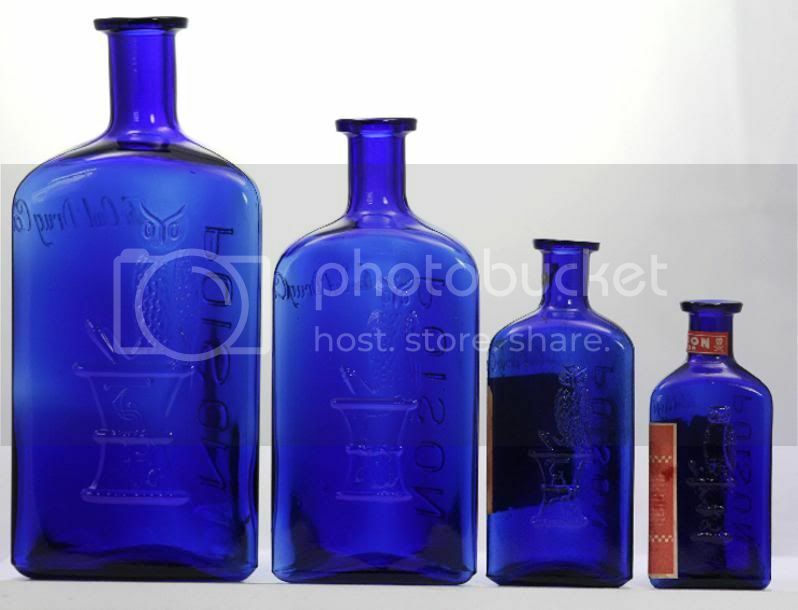 The later two wing 1908 bottles are found in eight recorded sizes. There are a number of variations of the owls to look out for such as long tail, no tail, short tail, potbelly and others. 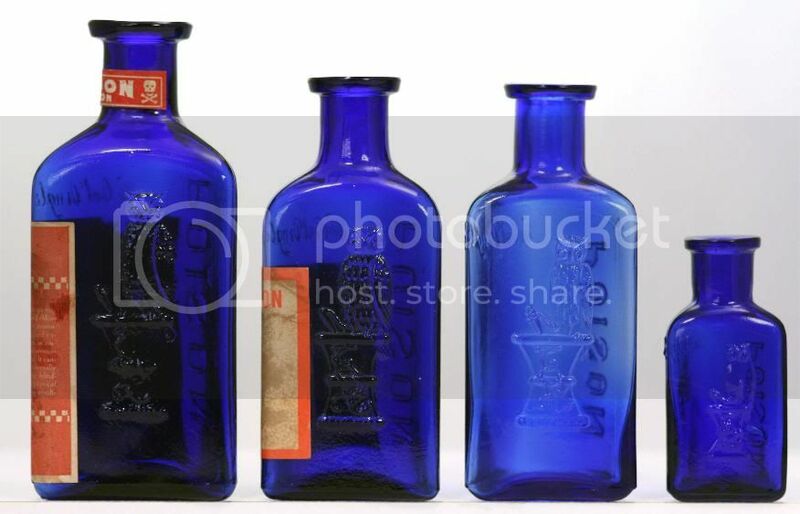 All the marked poison bottles are cobalt and triangular, the one wing owls have their trademark of an owl sitting on a mortar bowl on one panel. Poison embossed down another and The Owl Drug Co with a space for the label underneath on the third panel. Whereas the two wing have The Owl Drug Co embossed over the owl trademark on one panel. Poison down another and the third panel is blank. 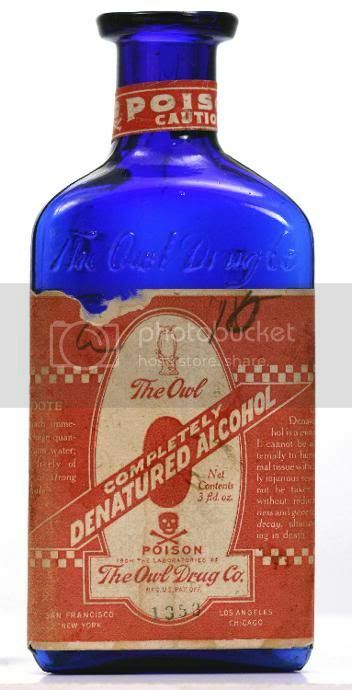 In 1920 the Owl Company was taken over by Rexall Drug and they immediately ceased production of the owl poison bottles. Photos 1 & 2. My collection so far of one wing owl poison bottles. The 32 & 1 ounce one wing owls, the 32-ounce is the rarest and therefore the hardest size to find, I bought it through e-bay and it still remains my most expensive e-bay purchase so far. It’s just over 10 inches tall and very heavy. The bottle was cellar found in mint condition, it arrived from Texas securely packed in an apple box. By contrast the 1-ounce is 2.5 inches tall. A labelled one wing owl bottle, note the skull & crossbones symbol used much more in the US than the UK.